Perfect makeup require a perfect finish in order to look legitimate. When selecting your make up, make sure you use proper lighting. For day wear, use natural light or a very white light. And for evening wear, a very slight blue light to apply by would be ideal. Never apply makeup by a yellow light. It will make you add too much make-up and the effect will not be good enough. 1. Make up selection – Choose your foundation and compact powder to match your own skin tone. Never choose a shade more than one shade darker or lighter than your own skin tone. 2. Cleaning – Clean your face from any natural or added oils and creams – this will allow your makeup to stay even, and look natural. 3. Base – Apply a foundation first to all parts of your face, blending it over and down your throat. Make sure it is blended well over your skin. 4. Application – Apply the final compact powder with a very soft makeup brush. The brush allows a natural look. It also allows even application. Work the brush downwards. Never brush in an upward motion as this can cause packing on your skin that appears to look like lines. 5. Eyebrows – Natural eyebrows only need a slight brushing. If added color is needed, use the exact color of your own eyebrow. A soft eyebrow pencil is excellent for adding color that looks natural. If you use a hard lead pencil, it will color your skin, and not the eyebrow hairs. For added shape, use a brush and add color lightly. 6. 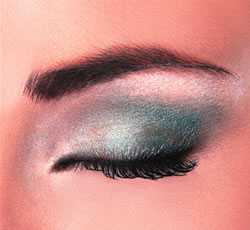 Eye makeup – In the case of eye shadow, choose a color that will enhance your eye color. (If it is for evening-match your clothing) applying eye shadows is an art. Use at least three colors all from the same color group. Start with your eyelid. Apply the lightest color there, medium in eyelid crease the darker color up to meet the eyebrow. Also apply the lighter color to the edges of the darkest color at the edges away from the center. After you have applied all applications, use the tip of your finger and blend it all together slightly. 7. Eyeliner – Use a medium brown or black. Use a tube liquid. It applies smoother and more evenly. Apply it to the edge of your eyelid above your eyelashes. Use long strokes to apply and make sure it is very close to your eyelashes. This brings your eyelashes and your eyelid into one. (If evening-you can extend the line at the side as a fuller look). Day wear should stop even at the edge of your eye. 8. Eyelashes – Use the browns or blacks. Using mascara with a brush, apply the mascara in full long strokes working upwards. This also will help the eyelashes to curl up instead of straight or down. Allow it to dry for a few seconds and apply again. A third layer may be used. Then, using an eyelash comb, slightly comb your eyelashes to part the hairs individually. Use can also use an eyelash curler to add make your eyes attractive. 9. Blush – This is optional, but many women use it to enhance the cheekbone line. Use a light rose color or a color of your choice. Use a soft brush, working from the high part of your cheekbone, work the brush toward your ears. Work the color at least one inch from your nose bridge. Blend with the brush. Never make it to dark, just a slight blushing look is enough. 10. Lips (Lipsticks, glosses and liners) – Choose a colour that will blend well with your blush. Use a shade darker for the liner, fill in with the lipstick and cover with a nice gloss for that wet look. Lips are very easy to do. Never-make un-natural peaks, but to make lips more supple looking; you may apply the colour and liner slightly above your own natural lip line. If you have deep lines in your lips, add more colours then use a lip brush to smooth the lines. This will hide any unwanted lines. Next articleDoes Your Child Misbehave Oftenly?